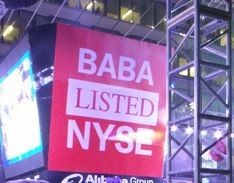 China’s biggest e-commerce business Alibaba held its IPO in the NYSE on Friday. It was huge success. Early in the day stocks changed hands at $92.70, much higher than the $68 some investors had paid. Alibaba became a publicly traded technology super-giant on Friday, with a company market value of $231 billion, which is bigger than Procter & Gamble. Initial investors saw gains of 38%, equivalent to more than $9 billion in profits, in just the first day of trading. The average first day increase for American-listed Internet and technology deals in 2014 has been 26%. Alibaba’s IPO sold 320.1 million shares at $68, trading under the ticker BABA. It raised $21.77 billion, easily beating Visa’s IPO of almost $17.9 billion in 2008. There is a 30-day option for underwriters to purchase approximately 48 million more shares. So, the offering may reach $25 billion, which would make it the world’s largest ever IPO. Larger first-day deals tend to have smaller jumps, making Alibaba’s impressive surge even more spectacular. Alibaba’s IPO means it is now super cash rich and can easily buy up a string of other companies and launch new products. It is likely to compete more fiercely with Internet rivals at home such as BIDU and Tencent, and also expand into international markets in a big way. Even though the company insists it aims to concentrate on its domestic e-commerce market, which from 2011 to 2015 is forecast to triple, most analysts believe it will not be able to resist the temptation of international markets, especially now that it has the financial clout. Alibaba Holdings was founded by former English language teacher Jack Ma, who started off connecting Chinese producers with American importers online fifteen years ago. He is now the richest person in China. His stake in Alibaba was worth more than $18 billion by Friday’s close. Mr. Ma sold almost $1 billion’s worth of stock yesterday. Welcome to US shareholder scrutiny and pressure, Alibaba. Investors are going to expect growth in a market with declining advertising rates. Unless the company comes up with new products and ideas, the pressure will grow. It will be interesting to see how Mr. Ma deals with western investors. He once said the greatest priorities for a company are its customers, followed by its workers, and then its investors in third place, but a long way down. Mr. Ma stood on the floor of the New York Stock Exchange on Friday together with eight of his company’s customers, and rang the opening bell. Alibaba is quite different from other e-commerce giants in that it does not sell anything directly to customers – it connects people and small businesses. Some of its platforms, such as TMall and Taobao represent 80% of China’s e-commerce. It has 279 million active buyers who visit Alibaba sites at least once a month on mobile devices, which makes its stocks especially appealing in a market that is shifting away from desktop and laptop PCs. Alibaba will need to break with history, though, if it wants to keep its investors on board over the long-term. Since the mid-1990s, Chinese stocks have typically burned both domestic and foreign investors. They tend to start well, but are notorious for not being able to keep up with inflation. Alibaba’s business activities occur mostly online. Therefore, we call it an e-commerce company.